What Are the Most Common Mesothelioma Symptoms? The most common symptoms of pleural mesothelioma include shortness of breath, fluid buildup and chest pain. The most common peritoneal mesothelioma symptoms include abdominal pain, diarrhea or constipation and unexplained weight loss. Mesothelioma expert Dr. Sugarbaker explains the most common mesothelioma symptoms. Recognizing symptoms of malignant mesothelioma early in the cancer’s development is nearly impossible because the disease doesn’t produce early symptoms to identify. How Do You Know if You Have Mesothelioma? The exact stage of the cancer at the time of diagnosis — how far it has progressed — is impossible to predict through symptoms alone. Most patients are not diagnosed until stage 3 or 4 because symptoms don’t develop until later stages. The earlier the cancer is caught, the better the prognosis. Frequency of symptoms reported in a 2011 study of 221 pleural patients. A machine pumps the medicine throughout the patient’s abdomen. This helps destroy any cancer cells left behind after surgery. Nearly half of peritoneal mesothelioma cancer patients who receive HIPEC can live at least five years after diagnosis. A lump in the testes is the most common sign of testicular mesothelioma — the rarest of all types. It accounts for less than 1 percent of all mesothelioma cases. When Do Mesothelioma Symptoms Emerge? Symptoms usually don’t make a noticeable impact on someone’s life until the cancer has reached a late stage. 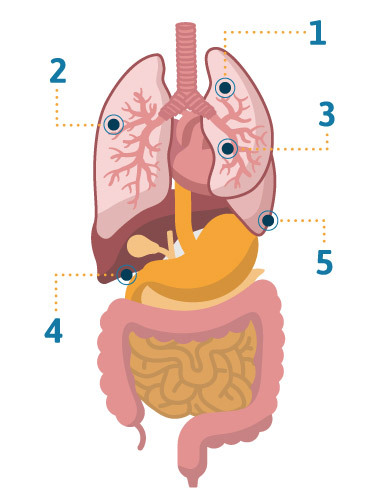 Most people who get mesothelioma of any type are diagnosed in stage 3 or stage 4. These are considered late or end stages. What Affects Mesothelioma Symptom Onset? Chest pain is primarily caused by tumors that have begun to spread into the chest wall. 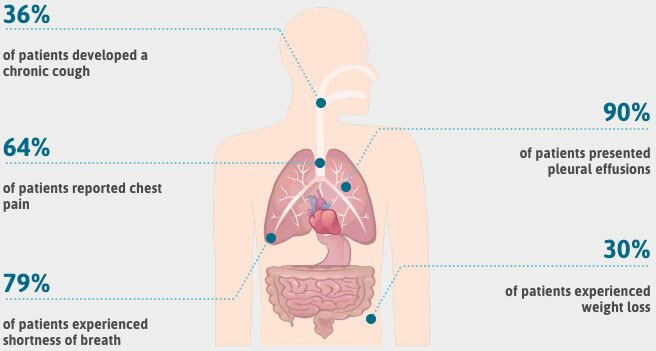 Difficulty breathing is caused by tumors that are restricting full expansion of the lungs. Pleural effusion is caused by tumors that have spread to the lymphatic system, including lymph nodes, preventing fluid from properly draining out of the pleural lining. Small tumor size is the main reason why mesothelioma patients don’t experience symptoms in the early stages of the cancer’s growth. 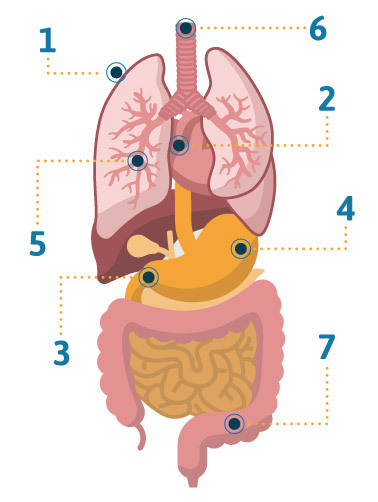 Mesothelioma tumors typically don’t become big enough to press against body parts until stage 3 or stage 4. Looking for a Pleural Mesothelioma Specialist? What Symptoms Indicate the Cancer Has Spread? How Can I Cope with Mesothelioma Symptoms?